A Madrid university has suspended an official over a fake degree scandal. The King Juan Carlos University suspended Enrique Álvarez Conde, director of the school’s Public Law Institute. The department allegedly awarded master’s degrees to two Popular Party (PP) politicians without them completing the work. But Mr Álvarez Conde said last week the university had pressured him to lie about the qualifications. The university’s president Javier Ramos denies pressuring the director. He also announced on Friday an internal probe into all the university’s departments. The Public Law Institute’s deputy director resigned on Tuesday over the growing scandal. In late March, news website Eldiario.es published a story claiming that the president of Madrid’s regional government, Cristina Cifuentes, had faked her master’s degree. The site claims Ms Cifuentes’ grades were changed, allowing her to obtain the master’s degree from the Public Law Institute despite not writing a dissertation. Ms Cifuentes initially threatened to sue the paper, and produced a certificate proving her credentials. But two of the three people who apparently signed the certificate say their signatures were forged. Laura Nuño, the department’s deputy director, resigned after finding her own allegedly forged signature in documents showing Ms Cifuentes took the master’s course in 2012. She says she “never even taught a single class” to Ms Cifuentes. The government opened an official investigation on 5 April. Forgery of public records carries a prison sentence of three to six years in Spain. The investigation has turned up evidence against another Popular Party politician, Pablo Casado, a member of the national Congress of Deputies. “I was not required to attend class nor take exams,” Mr Casado told radio station Onda Cero. He claims he was following instructions from the department director, Mr Álvarez Conde. The degree scandal could be a major headache for the ruling Popular Party, already facing criticism for how it is handling the Catalan independence movement. 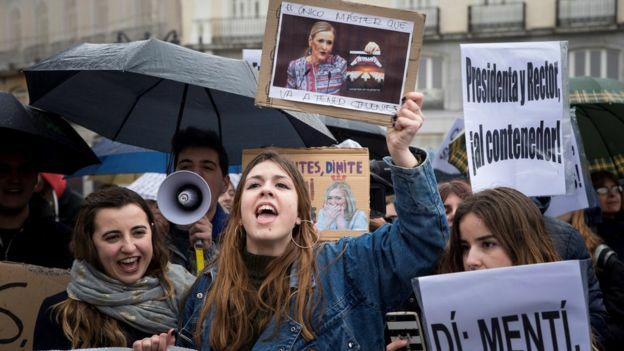 Ms Cifuentes is facing calls to resign from the opposition and protesters, which would mean the PP losing control of the Madrid government. The party is also facing allegations of an illegal financing scheme. Prime Minister Mariano Rajoy became the first sitting Spanish premier to testify in court over the allegations.